The right summertime cocktail does more than refresh on a hot day. It's got to be simple and near-infinitely drinkable, yes. But the best ones come with a story attached: the echoes of summers past. They're a link to cherished days. Days spent under a warm sun with good company. Late, comfortably cool nights spent laughing into the early morning. These are some of our cherished moments, and the cocktails that we're crushing on this summer. When I went to university, little did I know that I had been accepted into one of Canada's most prestigious party schools. For a Western undergrad, the intellectual pursuits seemed to go hand-in-hand with a dedicated drinking schedule. With it, an appreciation for the finer (and decidedly not-fine) points in drinking. Mix well and serve in red Solo cups garnished with a dash of adolescent hormones. Every seasoned porchclimb mixer adds their own embellishments to the brew, but the effects remain the same: it hits like a truck. And, despite the macabre list of ingredients, drinks like a fancy summer shandy with 4-times the alcohol. Fast forward nearly a decade after my first taste of porchclimb and my life is distinctly different. Despite my best intentions, I've grown up. My fridge no longer consists of takeout and buck-a-beers. I've travelled into, then out of, the corporate world. And, most notably, I'm recently married. The wedding was a 7-day celebration of love, family, and friends on a Mexican resort. Much drinking and mirth-making was had, just like the old days; we ate and drank like Vikings. Or Western grads. The difference is often imperceptible. As it happens, a couple bottles of mezcal found their way back to Toronto, safely stowed alongside wedding attire and sandy clothes. One bottle was decidedly better than the other; the runt of the litter begged to be made into a cocktail. This is my version of a paloma I sampled in Mexico. Several glasses through a session of recipe testing, I realized just how cathartic this cocktail really is. Behind the polished veneer of Porchclimb 2.0 lays a drink nearly as deadly as its predecessor. Rim a highball glass with lime and Tajin, then add ice. 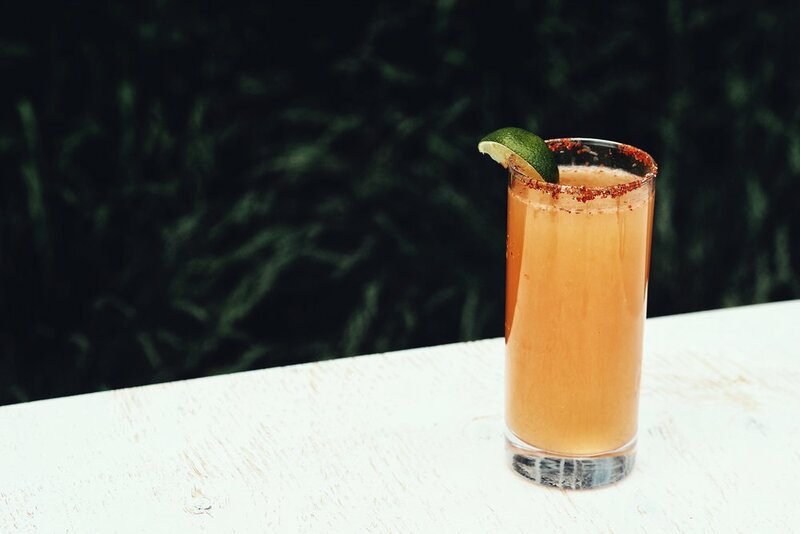 Combine mezcal, grapefruit juice, beer, and bitters and lightly stir. Serve garnished with a lime wedge. Try not to climb off of the patio. There are plenty of signs that summer has arrived. The first warm patio day. When short sleeves and dresses replace warm layers. But for me, summer hasn't truly started until I've had my first pitcher of sangria. It's a tradition that started with my best friend, Sheep. It was a cold day in - barely even summer. In the middle of a marketing class that seemingly wouldn't end, I posted a general MSN status asking if anyone was interested in getting sangria in the Montreal's Old Port. In true best friend fashion, Sheep was the first to answer. Despite the unseasonable weather, we managed to find a single restaurant with its patio open. Being a Tuesday afternoon, the place was deserted - we had the whole patio to ourselves. There we were, huddled in jackets on an empty patio, sipping our first "summertime" sangria. It must have been a strange sight for anyone passing by, but it was that one simple drink that made the summer's warmth approach faster. Now, no matter what, my first sangria of the summer must be had with Sheep. And, somehow every year we make it happen despite now living in different cities. One year it might be in Montreal. Another year, Toronto. The city doesn't matter with a best friend by your side. I'm a proud sangria snob. Your average pitcher of patio bar sangria simply won't do. There's more to sangria than substandard wine mixed with fruit juice. Good sangria packs a boozy, fruity punch; the only way to achieve that is with the liberal application of brandy. To keep the whole pitcher cool on the patio, I use a package of frozen fruit instead of fresh fruit and ice. Ice will just water your drink down. In a large pitcher, combine red wine and juice together. Slowly add brandy, tasting as you go. You might want less. You might scream "YOLO" and dump the full bottle of brandy in. Choose your own sangria adventure. Add frozen fruit and stir. Don't forget to eat the boozy pieces of fruit once you're done. Last summer was the first truly big alcohol event that I attended as an influencer. It was the launch of gin-inspired cocktails at this new bar that opened up in the Yonge/Summerhill area called "Clocktower Bar"; there were four different gin-based drinks to choose from, but I remember their blueberry gin the best. A year later, this particular drink still holds meaning to me. The launch party was a meaningful event for so many reasons. First, this was maybe the event that began all of the exciting things currently happening in my career as an influencer. It was a wonderful chance to connect with so many fellow creatives in the industry, and it was hosted by a fellow friend/blogger: Lauren from @thisrenegadelove. Opportunities came flowing through my inbox after this night! It also so happens that Clocktower's event was the day that I met my current significant other; the blueberry gin fizz was the first drink we shared together. He mentioned that he was from Banff and I instantly jumped into the conversation saying I'm from Calgary. I asked him if he was ready for another round of drinks. Something must have clicked, because despite already having a drink in hand, he said yes and followed me to the bar for another. Two drinks in hand, we bonded over our mutual love of the West Coast and realized how much we share in common. It was multitasking at its finest. He's since confessed to me that he wasn't a big drinker when we first met - but that's changed over the year of dating. My version of the Clocktower classic uses both fresh blueberries and blueberry simple syrup. If you haven't read one of our earlier cocktail articles, don't let the simple syrup scare you away! It's dead simple to make. Slap mint in palm of hand and add to glass along with crushed ice. Add gin, simple syrup, and soda water. Stir well, serve garnished with additional mint. Combine ingredients in a saucepan over medium-low heat. Cook, stirring occasionally, until the mixture takes on a jam-like consistency (about 20-30 minutes).